A rewarding kiddie cash-in! How so? With Brutal Legend’s fate still undecided, you might think us mad for recommending Kung Fu Panda as an alternative adventure starring Jack Black (not least because all the voices in this tie-in game are sadly provided by so-so stand-ins), but bear with us. First of all, we’re not so addled with bonhomie thanks to our experience with this silly game to deny that the action is the definition of ‘par for the course’. The jumping, exploring, coin-collecting and so on could come straight from Ty the Tasmanian Tiger no questions asked, and even the option for co-op adventuring is now entirely expected for this type of thing. But Kung Fu Panda is possibly the most lovingly crafted example of this dying breed of kiddie platformer. We’ve always presumed that the appeal of games adapted from CGI cartoons, for both developer and player, is that the visuals from the movie can be ported across to console with little loss of gloss – but this has never been the case. Ratatouille, Over the Hedge, even Wall-E, which is after all a film full of blocky metal droids – all such games have arrived looking like the movie scenes have been simplified to the point of sheer ugliness. Not Kung Fu Panda – the cuddly fighters, the beautiful sunsets, the lapping waves, Luxoflux have translated them with an unprecedented level of faithfulness. 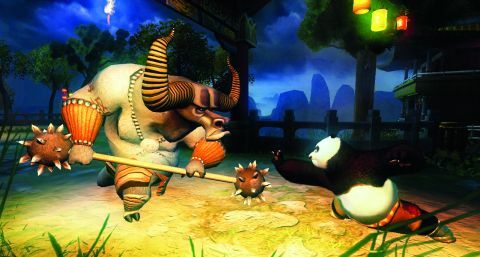 Even better, the movie’s martial arts theme has allowed Kung Fu Panda to double as a stupidly fun beat-‘em-up with charming and varied characters to control, and a huge helping of multiplayer arenas and minigames to unlock as you play. If the film didn’t exist, the game would still stand alone as a long-lasting shiny romp it’s positively unforgivable to dislike. Description Jack Black's CGI acid trip makes the inevitable transition from movie to videogame. Pray for mediocrity.